Ramping up renewed efforts to end mountaintop removal mining in central Appalachia, scores of protesters staged a daring action at the controversial Hobet strip mine today in Lincoln County, West Virginia, shutting down operations through a series of coordinated lock downs, tree-sits and banner drops. In a symbolic challenge to the Obama administration's failed regulatory policies, the protest targeted the Hobet mountaintop removal mine, which had been granted a widely denounced permit over two years ago. 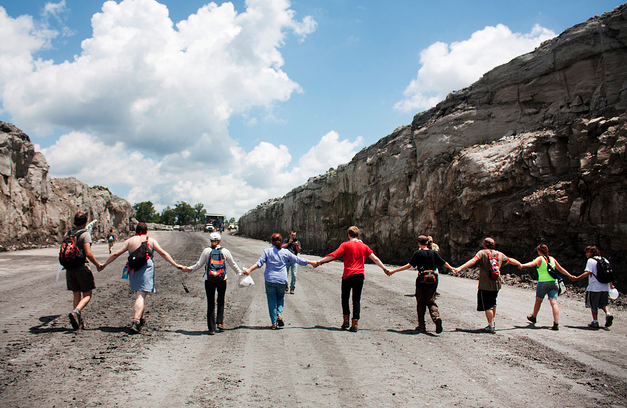 According to RAMPS, a West Virginia-based grassroots groups that organized the "mountain mobilization" protest as part of a nationwide summer of actions against devastating extraction industry operations, St. Louis-based mine owner Patriot Coal has left behind a legacy of destruction in coal country for both area residents and miners. Patriot filed for bankruptcy earlier this month, which could also affect pension and United Mine Workers of America union contracts. "The government has aided and abetted the coal industry in evading environmental and mine safety regulations. We are here today to demand that the government and coal industry end strip mining, repay their debt to Appalachia, and secure a just transition for this region," said Dustin Steele of Matewan, West Virginia, in a released statement. The son and grandson of union coal miners, Steele took part in one of the truck lockdowns. Protesters at Hobet mine in Lincoln County. Photo courtesy of RAMPS campaign. Citing the mounting evidence of the health and humanitarian crises in the coalfields from toxic mining fallout, including a rise in black lung disease and links to birth defects and cancer, the protesters also stationed banners on the mine site: "Coal Leaves, Cancer Stays." "The coal companies are poisoning our water and air, and they're treating the workers no better than the land -- fighting workplace health and safety protections to get the most out of labor as they can," said Junior Walk, a former coal company employee from nearby Whitesville, West Virginia, who won the 2011 Brower Youth Award for his environmental activism. Protesters also called on the Obama administration and regional politicians to launch more sustainable job training and coalfield regeneration projects. A bill, the ACHE Act, calling for an emergency moratorium on mountaintop removal mining was recently introduced into Congress. For updates on the protests and arrests, follow RAMPS campaign. An earlier version of this post incorrectly stated that the Hobet mine was in Boone County. It is located in Lincoln County.